When Jamshedpur FC came away from Kanteerava Stadium with a well-deserved point after a 2-2 draw against Bengaluru FC, they had an unlikely hero who got them going. The Indian Super League saw a marquee player join the ranks this season with Tim Cahill joining Jamshedpur but he wasn't on the scoresheet on Sunday night. Instead, it was a substitute who opened the scoring for the visitors. At 1-0 down, Gourav Mukhi came on with 20 minutes to go and Jamshedpur needing a goal. And sure enough, in 10 minutes, he had ensured that the Blues conceded their first goal of the campaign. "The coach has a lot of faith in me," Mukhi said after the game. "I scored just 10 minutes after coming on [as a substitute]. He had faith in me to score." 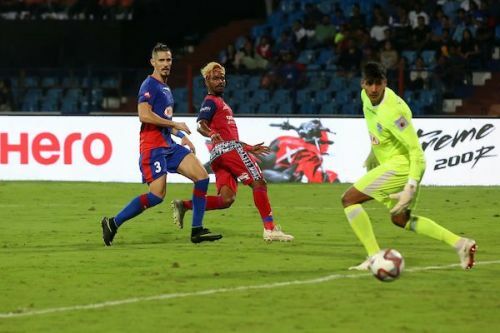 Mukhi managed to get goalside of Bengaluru defender Albert Serran to latch on to a lob behind the defence, before slipping the ball past goalkeeper Gurpreet Singh Sandhu. "It was always my dream to score against Gurpreet Singh," he said with a big smile. "It was also my dream to play against Sunil Chhetri and score a goal in that game. "It was not only my dream but also my father's dream to score like this and I was very happy I was able to do that." His father, Chotelal Mukhi, also played football in Jamshedpur. The forward, who initially played for Mohammedan Sporting and Tata Steel before joining the Jamshedpur Reserves, was confident he could score more goals if he is given the chance. "My target is to score as many goals as the number of matches I get to play," he said. "I didn't score many goals in the second division. I had only scored six goals in 10 matches. "So when I joined the senior team, my target was to score more goals than I did with the reserves. I had scored twice against the Bengaluru FC reserves. Nishu Kumar had played in that game too!" Both teams are now tied on four points with three other teams after two games. Jamshedpur next play ATK at home on 21 October while Bengaluru travel to Pune City on 22 October.